When life hands you lemons, ask for the tequila and salt. You could eat a hardboiled egg later, if you want. That's what I call a recreational meal! Oh tequila for me too and a couple of those rolls, they look good! That was an inspired combination! My mum is visiting tomorrow and I have eggs and lemon, i wonder if I am brave enough! 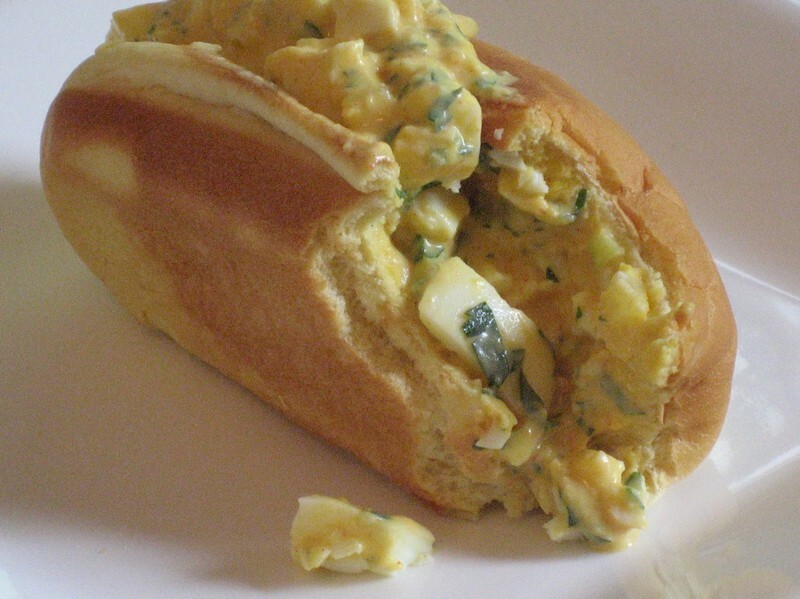 Egg salad is a favorite around here...this is a treat! I may have to give it a try. I'll have mine on sourdough toast! Sally: I loved it. Of course, I love preserved lemons in just about anything. I find egg salad to be really rich, so I like the addition of anything tart or acidic. Capers, too. Yum. Heath: Sweet, sweet delicious sleep. I should post a recipe for that. Of course, I'm the last one to offer advice on that front since it took my youngest A YEAR AND A HALF to sleep through the night. Sandi: Sourdough -- that's perfect. Holler: Just keep in mind that it's preserved lemon peel, not regular lemon peel. That pickling process makes a world of difference. Gram: Your logic is much better than mine. And I'm ashamed of myself. Wow, that disturbing sausage guy looks JUST like you, Husband, down to the table manners. The reason egg salad makes some dishes taste so good is that is is loaded with "umami", that elusive fifth taste (along with bitter, sweet, salty, and sour), an amino acid actually that makes everything taste more delicious. That looks absolutely delicious. A really great use for preserved lemons. We have a jar lurking in the fridge so I will try this for a packed lunch next week and impress the building team that I'm working with. Thanks.